Bookcases available in a choice of three heights in Blonde Oak or Walnut and have a stylish silver effect feet. Available from stock for a free next day delivery to any UK mainland address as standard. Office storage is arguably just as important as desks in the office. Even though it seems we are gearing towards the paperless office, we are still a long way off it. 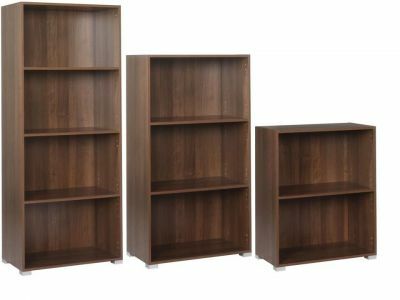 The importance for office storage is still the same as it has ever been and these bookcases form part of the Insight range of office furniture. Available in a choice of Blonde Oak or Walnut, these bookcases are available from stock in three different height options to suit your office. Manufactured to a high standard and delivered within the next working day from order if the order is placed before 12pm the previous day, these are made from 96% recyclable materials.